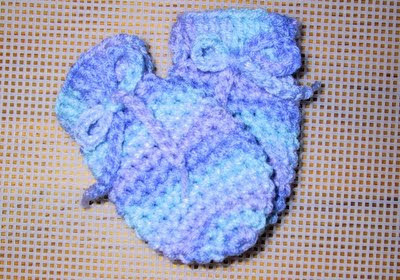 i made mine for the baby im expecting .. i love your blog..
Great and simple pattern. : )) May I use this pattern for charity donations? Thanks again. Yes this and any of my patterns may be used for charity donations. The only restriction is on the selling the items. any chance4 of a hat and booties to match. Many, many thanks. may we sell the items if all monies collected go to charity, as in a charity bazaar? I have several baby blankets already crochet (I had hoped to eventually sell). I would love to donate some if not all but practically all have pastel yellow included. Each one is a single granny square (32" x 32" aprox) done in multiple pastel stripes/bands in baby weight yarn. Does your yellow restriction include a few bands of pastel yellow in blankets such as these or will they be acceptable? I don't know what you are referring to about yellow or donations. Perhaps you have this blog confused with another. What is the difference between your fraternal mittens and these mittens? Yarn weight is the difference. The fraternal ones are out of sock weight (1) yarn. My mitten is not 3.5 inches after row 14. Do I continue with more rows until I get the length I need? Yes that is what I would suggest.